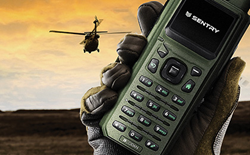 Codan Radio Communications has announced the launch of Sentry-V, a military VHF handheld radio. Sentry-V is the first product to launch from Codan’s new Sentry family, with the second product to be launched at Africa Aerospace & Defence in September. Codan has been a long-trusted supplier of HF radios, and the Sentry-V is a logical extension of our product family to meet the needs of our customers. Eurosatory 2016, booth #BA607 (PRWEB) June 13, 2016 -- Codan Radio Communications, a division of Codan Limited (ASX-CDA), has announced the launch of Sentry-V, a military VHF handheld radio. Sentry-V is the first product to launch from Codan’s new Sentry family, with the second product to be launched at Africa Aerospace & Defence in September. Sentry-V operates across the 30 MHz – 88 MHz frequency band with AES-256 encryption and advanced voice coding technology for superior voice clarity. The Sentry-V encapsulates the strengths of the Sentry product family including rugged design to MIL-STD-810G, ease of use and an intuitive icon-based colour graphical user interface. “The addition of Sentry-V to our product portfolio enables Codan to provide a complete radio solution with VHF for short range communications and our proven HF radios for long range communications,” said Mr. Steven Jenkins, VP & General Manager, Codan Radio Communications Australia. The Sentry-V is based on a Software Defined Radio platform, with voice and data transmission capability across analog and digital networks, supporting all major protocols, including P25, DMR, Analog FM and DVOA. Capabilities include a multi-lingual interface, on-screen GPS mapping, Bluetooth interoperability and configuration as a portable repeater to extend the communications range of a network. “In light of the growth we have experienced throughout our global markets and particularly Africa in the past two years, and following strong demand from our customer base, Codan has decided to further its investment to expand its presence and product offering in the military market,” said Mr. Paul Sangster, VP of Sales for Communications Products. Demonstrations of the Sentry-V will be taking place on the Codan Radio booth #BA607 at Eurosatory 2016. Codan will also be demonstrating the new Codan RIOS, an interoperability system to connect communication devices including radios, smartphones and computers, supporting all signaling platforms including HF, VHF, UHF, 700/800 MHz, cellular and satellite phones.